As a Christian who loves science, it pains me to perceive that many people believe that Christianity and science are in some way at odds with one another. These individuals see faith and science as being mutually exclusive. If you are one of those individuals, I'm not writing this to belittle you or mock you. I respect your opinion and hope you have valid rationale for thinking that. However, my experience has been quite to the contrary. When I entered graduate school to study biomedical science, I was one of these people. I was under the impression that the scientific community was largely hostile to Christianity. I was taught that Christians should leave their faith in the trunk of their car when they enter a campus of academic and intellectual pursuits. I am always open to changing my opinions, and experience is one of my best teachers. What I learned during my years of academic research was that many brilliant, tenured, high-ranking, well-established, peer-reviewed, scholarly individuals also had strong roots in their Christian faith. This surprised me because of what I mentioned two paragraphs ago. These folks were not shoving God down anyone's throat. They were not opening the Bible during their academic seminars. No faith-oriented soliloquies were presented during their journal clubs. These folks were real-life, down-and-dirty scientists that sliced their own ideas to pieces to get at the facts. But their system of thought that dictated their moral compass and their aspirations to improve the world were largely founded in Biblical Christianity. And these people became some of my best mentors--some of my greatest role models. I learned from them, and I still do. I'm excited by all the scientists that are balanced enough to love the pursuit of scientific knowledge and still maintain an unwavering devotion to the God they hold most dear. They love Him and His Creation. They want to learn more about nature and develop tools and theories to that end. However, to be fair and open, I have also met block-headed, anti-science, nitwit Christians that think science somehow pollutes the Christian walk. Notice I'm a little more harsh on the Christians than the non-Christians. Why? Because they should know better! Nearly half of the book of Proverbs tells the Christian believer to pursue knowledge and understanding! Did these folks skip Proverbs? Please, the next time someone says or insinuates that Christianity and science are opposed to one another, or that Christians cannot be "rational" scientists, I hope you'll think twice before you believe them. "Is the Bible scientifically accurate?" 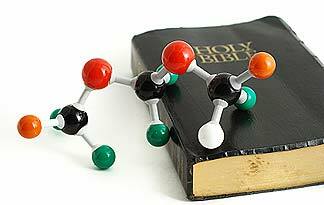 "What should Christians do when there is an apparent conflict between the Bible and science?" And many more. These questions are important, but not part of this post. Another day, another post.